When your family is from the East Coast and you’ve decided to make a life for yourself in Alaska, most of your traveling ends up taking more than twelve hours. It’s hard to get excited about a 3000 mile journey while it requires you to get up at 4:30am just so you can make it to the airport in time for the humiliating dissection of your luggage. Then, if you’re really lucky, you’ll have middle seats between two strangers for the next half-day, not to mention long layovers in airports with chairs intentionally designed to be uncomfortable. I love flying, but somewhere along the way, I lost the excitement for it. It’s precisely because most of my travel is extremely tedious that I wasn’t looking forward to flying to Fairbanks last Sunday. I suppose it didn’t help matters much that my trip was work related – three days of training on a new web portal isn’t exactly my idea of fun. The only good thing about traveling for business is that the University foots the bill, so there’s that. But hey, I wouldn’t want to get dooced, so enough about work. I woke up Sunday morning with a lot to do before my plane was scheduled to leave at 1pm. I don’t know what it is about me, but despite my best intentions, I never seem to pack before the last minute. After going to bed rather late the night before (Curse you, World of Warcraft! ), I awoke at 8:30am with my mind already creating a to-do list. Before tackling the list, though, I started the day like most every other day that I manage to get up before Oksana. I stretched my arm into the partially closed refrigerator and cracked open a Diet Coke as quietly as I could. While ingesting my much-needed caffeine, I sat down at my desk and read some of my daily web sites. When my eyes could stay open without conscious effort, I started in on the first task on my list – backing up and transferring the files I’ll need on my laptop. The rest of the morning was filled with all the things I should have done the day before: Laundry, shaving, packing, finding contact info for the hotel and printing out Internet maps of Fairbanks and the UAF campus. Somewhere during all that, Oksana came out of the bedroom and went back to sleep on the couch. Envy. Once in the waiting area, I found myself a part of a group of people captivated by a televised game of football. The Philadelphia Eagles had just gone into overtime against the Cleveland Browns and, for the first time, I actually hoped that my flight would be delayed. It was not to be. After a couple change-of-possessions, we were herded onto the plane without crucial ballgame closure. The pilot knew our plight, though, and before we had even begun taxiing down the tarmac, he announced that the Eagles had won. Dang it. The last time I flew to Anchorage was for an ultimate tournament a few years ago. Since I can hardly remember the trip at all, it must not have been very interesting. Once on this flight, I buckled into my seat, opened up a book (I, Robot), and expected to suffer through the rest of the day in cramped, anticipatory boredom. Less than half an hour into the flight to Anchorage, the pilot informed us that we’d soon be passing Mt. Fairweather. It’s a big mountain, something like 14,000 ft, so I opened my window shade and took a look out. At first, all I could see was an immense white cloudscape below. Within a couple minutes, though, we came upon the mountain, towering through, white snow over white clouds. The sun, low in the west, cast hard, sharp shadows beyond the peak, leaving a dark triangle of black behind the mountain. 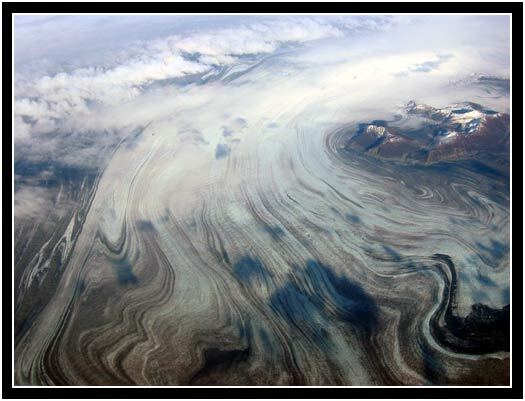 I dug my digital camera out of my carry-on bag, but not soon enough – all I managed to photograph was a flat glacier and a nice, big jet engine. Mt. Fairweather looked to be the only mountain tall enough to climb through the clouds, so once we left it behind, I went back to reading my book. Before long, the flight attendants busied themselves with the snack cart and I decided not to indulge in one of those lame bags of Alaska Airlines pretzels. When it was my turn to shout my request for a Diet Coke over the roar of the engines, I noticed that they were not handing out pretzels, nor even peanuts. 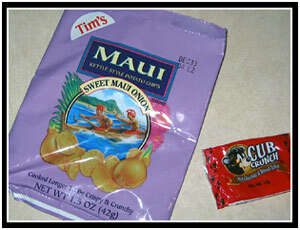 Today’s special was Onion flavored Hawaiian potato chips and a fudge-toffee bar made locally in Juneau. What the heck, why not? I accepted these non-traditional refreshments along with my Diet Coke and a plastic cup over-filled with ice. A quick look revealed still nothing outside the plane, so I went back to reading my book. Both the tiny candy bar and the onion chips were very tasty, but since I hadn’t eaten anything all day, that may just have been hunger. It’s rare when an airlines surprises you and I, for one, appreciated it. The flight to Anchorage took a little longer than I expected, but I didn’t mind. Up past Yakutat, the skies began to clear a little bit and I could admire the land formations below. I’m quite used to the sights over Southeast Alaska – I’ve probably flown back and forth to Seattle 50 times in the last 20 years or so – but the landscape where the panhandle joins the interior is very different. Looking through holes in the clouds, I could see miles of coastline that cut straight as an arrow across the ocean. What must have been huge breakers rimmed the coast in undulating white curves, and whitecaps speckled the Gulf over deep waters of dark blues and shallower greens. The real attractions, though, were the inland glaciers. Many of the shapes were familiar to someone who has flown over the Juneau ice fields – smooth, white ice gradually breaking into large crevasses and blue towers near the terminus; even at 30,000 feet, I could see icebergs floating in front of the tidal glaciers. But the most amazing displays were of the massive flows of ice that were warped into amazing contortions. Dozens of miles of ice fields twisted into view and curved about like so much melted taffy. Even the ground, where it had been exposed by receding glaciers, had conformed to the same patterns. As I stared out the window, my book completely forgotten on my lap, I realized what it was about Earth and rock formations that fascinate people enough to become geologists. I’ve never much cared to know the dip and strike arrangements of outcroppings, but as I gazed upon the strange shapes below me, I couldn’t help but want to know how they were formed. How many other places in the world – fjords, volcanoes, canyons, etc. – would be as fascinating from the air? Screw geology, I’d rather be an explorer. Better yet, a pilot! Imagine what an Alaska Airlines pilot gets to see as a matter of routine: Denali at sunset, the Aurora Borealis from 35,000 feet, erupting volcanoes, and perhaps even “little” things like avalanches, herds of caribou, and pods of whales. As I was caught up in my career path musings, we started our descent to Anchorage. The view became cloudy again, but just as we started our bank around the Kenai Peninsula, the city came into view. I must admit that I’m always impressed by Anchorage’s urban sprawl. I’m used to seeing cities stretch as far when I’m flying over the Lower 48, but it just doesn’t seem as though an Alaskan city is capable of doing the same. We landed in Anchorage and I only had to shift over about two gates or so for my next flight to Fairbanks. The layover was gratefully short and after I sacrificed my seat to someone who needed a power outlet for their computer more than I, I barely had time to write out a new scene for Doctrine before they were calling for us to board. Unfortunately, the Anchorage-to-Fairbanks leg of my trip was less interesting. The flight was overbooked (six passengers who, unlike me, didn’t need to be in Fairbanks, all got free tickets for giving up their seats) and the best I could do was an aisle seat. Though the flight was blissfully short, they only served us 3 ounces of orange juice and a tiny bag of salted peanuts – no fancy treats for the Fairbanks bound. I was also disappointed to miss out on a window seat. I’ve never been north of Anchorage, and I was looking forward to seeing the interior of Alaska. Worse still, was the realization that I’d be flying into Fairbanks without a look at the city itself. Would the city be flat or mountainous? How big is the Cheena River that bisects it? Is it spread out like Anchorage, or does it cling to the water like Juneau or Ketchikan? I wouldn’t have any idea. And I didn’t. We landed and I deplaned. Following the signs to baggage claim and transportation was easy enough, and because I brought all my luggage as carry-ons, I didn’t have to wait with the masses. I turned on my cell phone and called Sophie Station, my hotel, to arrange for their shuttle to pick me up. After they assured me that they were on their way, I dug out my winter coat, hat, and gloves from my backpack and put them on. Through the glass doors near the baggage claim, I could see snow on the ground. I was about to enter the harsh Fairbanks winter I’d heard so much about. It wasn’t that bad at all. Seeing 15-foot mounds of plowed snow in the parking lot had me worried, but that was only because I was expecting the worst. As I stepped out into the crisp air, all the horror stories of endless nights and 40 below days told by UAF veterans occupied my thoughts. But what I saw didn’t fit with those tales. It was about 5pm and there looked to be plenty of light left in the day. And while Weather.com told me that the temperature in Fairbanks was only 16 degrees when I left Juneau, it felt to me like it was hovering right around freezing. With my big coat zipped up and my wool hat pulled down over my ears, I was perfectly fine. Fairbanks isn’t so bad. And when your day of traveling isn’t 12 hours long, neither is Alaska Airlines.